The spirit of Vatican II marches on, with +Francis now calling for a re-examination of priestly celibacy. The doctrine is not of itself the real controversy. 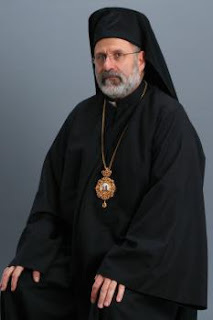 After all, the Orthodox allow priests to marry with some important qualifications: a priest cannot marry after ordination, and bishops must be celibate. A good illustration of the twin dignity of both sacraments is the person of Antiochian bishop +John. A priest married for 33 years, he was elevated to bishop after the repose of his wife. He now carries the Church in his person and cannot remarry. So, if the Catholic understanding concerning the sacraments of priesthood and marriage becomes malleable once enough bishops disagree with it, then Synods aren't discerning eternal Truth guided by the Holy Spirit. They're just secular policy-making bodies with no more theological and thus ecclesial authority than a parish book club. Or, in another context, no more authority than the Parish Life Conference recently attended by several Orthodox Patriarchs. Or than me. In other words, the Catholic Church is becoming not so much hierarchical as episcopal, which means it will become Episcopal. The geography is important as well: Rome is becoming a Global South Church. Catholics like Ross Douthat banking on the Global South to save the institution are going to be disappointed. And as with The Episcopal Church, the crack-up (which I should add I consider probable, and not certain) will be bitter indeed. Our good friend Porter is even less optimistic. Prayers for all of Christ's Church. Care to make a post on tonight's election results? I would be repeating myself: change the people, change the place. For what it's worth, even in the Latin rite the Catholic Church has always granted occasional exceptions to the general rule on priestly celibacy- nowadays, these are typically converted former Anglican priests- and Eastern Rite Catholics mostly follow the same rules as the Orthodox. You're right that it's an issue of authority and hierarchy, though- a major decision like that isn't something to leave up to some local synod with who-know-what ulterior agendas. As is typical since Vatican II, the choice will be quietly made by a closed clique of the bishops' senior staff members, after only a bare pretense of honest debate and discussion (any results of which they will totally ignore). I'm no theologian, but I wouldn't be terribly shocked to see Pope Francis posthumously suffer a similar fate as Honorius I before the century is out. It seems like he's a prison warden who's so friendly with the gang leaders that he lets them run the place, and rarely sends backup to his officers when they need it- a leader who barely leads. Well, as always, it's up to our prayers and God's mercy.